Bacterial flagella are long, thin (about 20 nm), whip like appendages that move the bacteria towards nutrients and other attractants. Flagella are free at one end and attached to the cell at the other end. Flagellum can never be seen directly with the light microscope but only after staining with special flagella stains that increase their diameter. The long filament of flagella is composed of many subunits of a single protein, flagellin, arranged in several intertwined chains. The energy for movement, the proton motive force, is provided by ATP. Key Information: Most of the cocci (e.g. Staphylococci, Streptococci etc) don’t have flagella so they are non-motile. Flagella are helical shaped structure which is composed of subunits of a protein called flagellin. The wider region at the base of the flagellum is called hook. It is different in structure than that of the filament. Hook connects filament to the motor portion of the flagellum called basal body. The basal body is anchored in the cytoplasmic membrane and cell wall. There are presence of rings which are surrounded by a pair of proteins called Mot. These proteins actually drive the flagellar motor causing rotation of the filament . 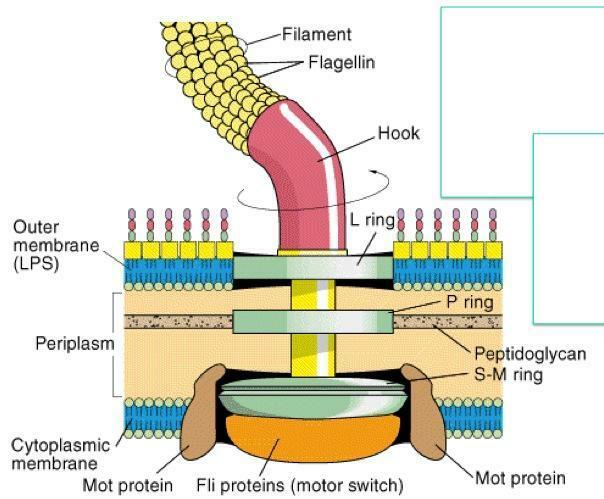 Another set of proteins called Fli proteins function as the motor switch, reversing rotation of the flagella in response to intra-cellular signals. Arrangement and Types of Bacterial Flagella The number and location of flagella are distinctive for each genus. There are four types of flagellar arrangement. Monotrichous (Mono means one): Single polar flagellum e.g. Vibrio cholerae, Campylobacter spp. (polar flagella often in pairs to give a “seagull” appearance). Many prokaryotes are motile, and the majority of motile prokaryotes moves by means of flagella. Role in Pathogenesis: Escherichia coli and Proteus spp are common causes of Urinary tract infections. The flagella of these bacteria help the bacteria by propelling up the urethra into the bladder. Some species of bacteria, eg. Salmonella species are identified in the clinical laboratory by the use of Specific antibodies against flagellar proteins. Organisms such as Vibrio cholerae (darting motility) and Proteus species (swarming growth in common culture media) are easily identified by their characteristics motility pattern. how does bacterium move according to the arrangement of their flagellum/ flagella? to what direction? do they move fast of slow? Salmonella relase a black colony on XLD Medium. How Salmonella release a black colony on XLD Medium and connectivity Mechanisms between s. typhy and s. enterntis on XLD Medium? These is useful short notes!!! Do intracellular bacteria grow flagella if they are flagellated in vitro and can proliferate in cell cytosol? Can e. Coli with flagellum cause band 41 on the western blot to be positive?